Our Vermont Castings Vigilant was installed October 2012 and we put in a solid winter of heating with it. It occurred to me that the installation was rather difficult, not because of any construction or fabrication complexity, but rather because information on the topic was hard to find. For that reason, I wanted to share with you how I went about our installation. As you can see, we were starting with a chimney that contained a fireplace insert and had a 10″ stainless steel flue liner. I removed the insert and wanted to install the wood stove. Option A was what I considered the traditional setup, with the stovepipe exiting the stove vertically. That is how my dad had ours set up. This installation would have required drilling out some of the brick, installing a clay thimble (absolutely no one I talked to confirmed that these things even exist anymore) and then putting a damper below the spot in the existing chimney where the thimble connected. I had no idea how I was going to connect the clay thimble (or even a stovepipe instead) to the liner in the chimney because it would have been near impossible to reach inside there. Option B seemed easier and would also leave the attractive brick chimney intact. 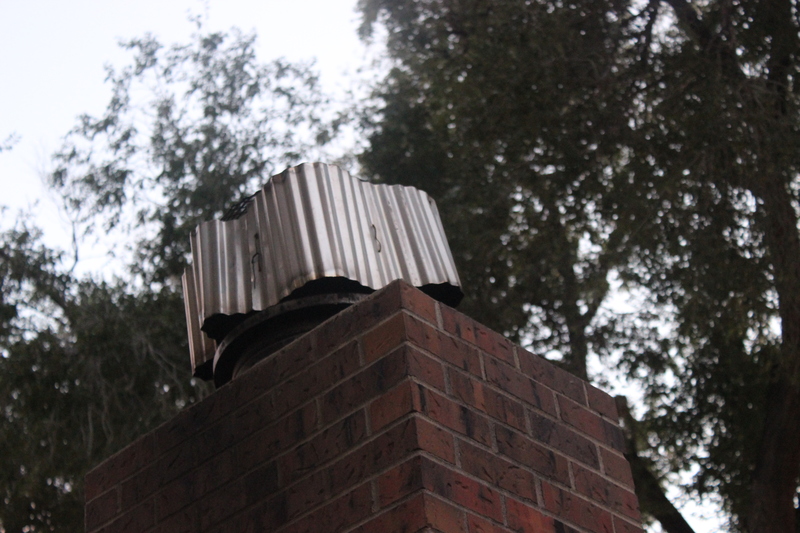 A reducer was needed to connect the 8″ stovepipe from the stove to the 10″ chimney liner. This also required that we shift the stove’s pipe exit to the horizontal position. The main problem was this: the stove was too tall. The exit pipe was taller than the fireplace opening. I fixed this by purchasing some shorter legs for the stove and also by redesigning the hearth pad to minimum thickness. The original plan for the hearth pad was to use the 3’x5′ Durock cement board set on some furring strips and then make a brick base to match the color of the existing chimney and also match the height of the lip in front of the chimney. Instead, I started with the same cement board and furring strips, but laid some nice looking slate tiles down that were only 1/2″ thick. Because I was using shorter legs on the stove I also constructed my own heat shield to sit under the stove using some 24 gauge sheet steel found at Lowes. Now you can put your hand on the slate directly underneath the stove when you’ve got a rip roaring fire going. Starting at the bottom, you see the floor, followed by furring strips, Durock, slate, two layers of heat shields and then the bottom of the stove. 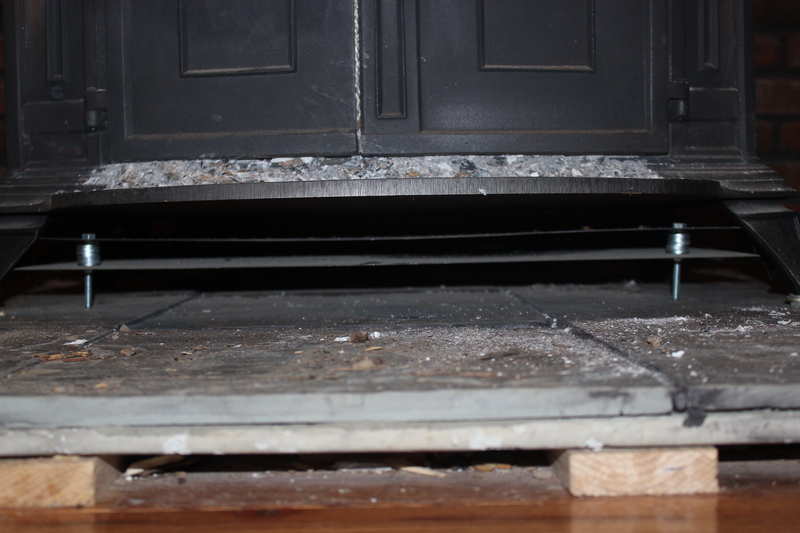 Even with this shorter hearth pad and shorter legs on the stove, the exit pipe still had a slight downward slope. I was worried about that, because I’ve never seen smoke flow downhill. Another chat with my uncle about this brought my confidence back. Get those pipes hot, creating plenty of draft, and that exit pipe will never be a problem. He was right. That doesn’t mean we never experienced problems. Ha! Boy did we have problems! Thanksgiving 2012 was very windy and we had a house full of family. The wind came from a direction where it seemed to blow directly down our chimney, filling the house with smoke. That made for a rather stressful day and would have been fine if it was a one time occurrence. My quick remedy was to fill the stove with paper and small sticks to make an intense fire and get things really hot. That definitely worked, but didn’t solve the problems at night when you shut the dampers. Unfortunately this happened many times before I was able to fix the problem by treating the source rather than the symptoms. Dismayed at the prices of these fancy stainless steel wind proof chimney caps, I decided to make my own by tying some scrap sheet metal to my existing chimney cap with tie wire. That, combined with filling any and all seams on the stovepipes with furnace cement meant that we didn’t have any more trouble with smoke in the house. In conclusion, I must say I’m very happy with this stove. We only spent a couple hundred dollars on propane heating our home last winter, where our neighbors spent thousands. Gathering firewood is a lot of work, but to me is enjoyable and part of what I call my country boy’s gym membership. Most of the wood I have is found free by cleaning up neighboring properties. 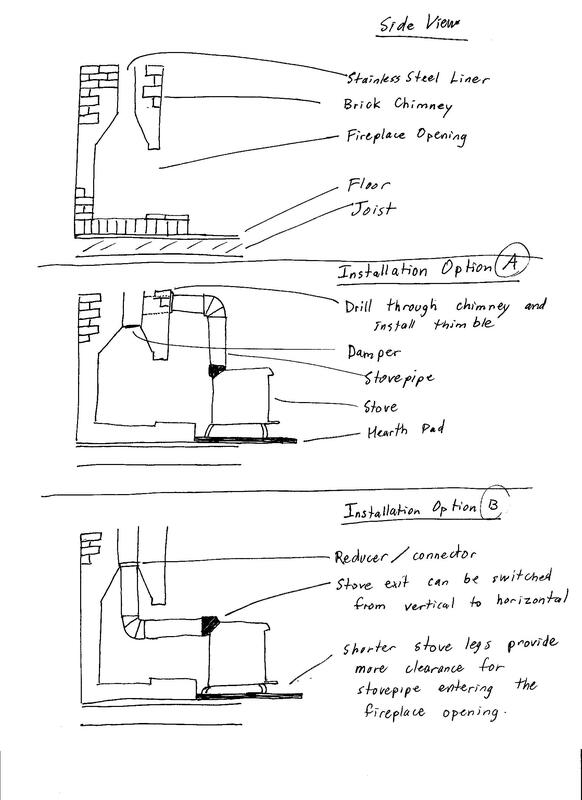 This entry was posted in Energy and Alternatives and tagged chimney cap, DIY, draft, Durock, fireplace cement, furnace cement, hearth, hearth pad, heat shield, install your own woodstove, installation, reducer, Rutland, stovepipe, Vermont Castings, Vermont Castings Vigilant, Vigilant, windproof, windproof chimney cap, woodstove. Bookmark the permalink. Great blog postings. I also recently located a vigilant stove and the manual online and have been researching and mapping my installation. Conversely the stove I bought was altered for a low fireplace installation( I.e. Short legs and floor heat shield. In my installation I won’t need these and would prefer to have the longer legs. By chance would you be interested in selling the legs you removed? If so please email. Thanks! Thanks for the thoughts, Brian. I’ll keep that in mind for the future. That would shorten the length of horizontal pipe, which I expect would improve draft. i have a Vigilant wood/coal burner from the 80’s. in what appears to be ecxellent condition. 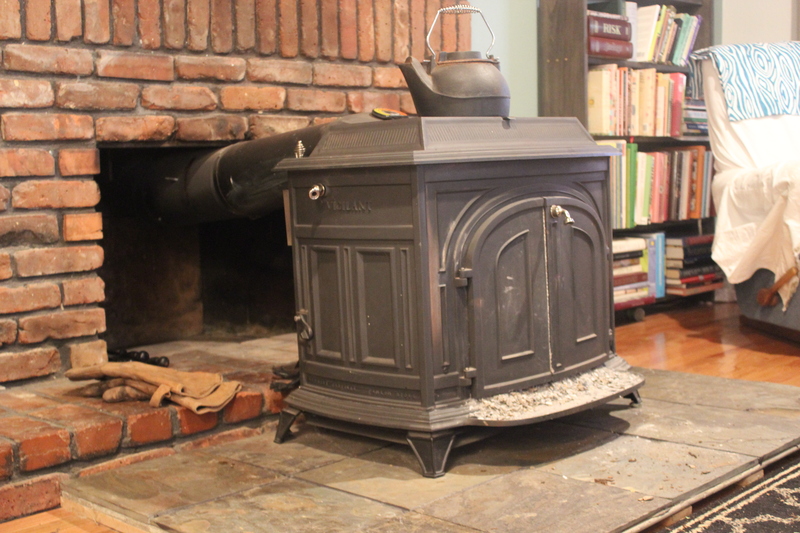 it will sit on the hearth and vent into an existing 6″ thimble where the fireplace was closed up years ago to accomodate a wood stove (a horizontal inatallation). problem #1. My stove has an 8″ exhaust. Would it be ok to use a reducer for the short distance from back of stove into thimble? once inside the fireplace opening there is the standard terra cotta flue. i really dont want to have to chisel out a larger hole, but was unsure if this reduction would affect draw, burn, etc. Problem #2. the stove has no legs…but we can fabricate metal ones to correct height). Since the stove will sit on the hearth, are bottom heat shields requured? Note: We will be putting a heat shield on the floor in front of the hearth for when doors are open for viewing fire or emptying ashes. i am in N.C. so won’t be at my computer till Sunday (snow storm) and dont get emails on my android. could you comment on your blog also so i can see it. Thanks for stopping by, Helen. I’m no expert, but I’ll share my opinion on your questions. 1. Reducer 8″ to 6″ on the short horizontal section. I wouldn’t hesitate to give it a try. I should mention that I’m now half way through my third winter with this setup and while it works great, it does require you to know what works. I can never load the stove from the top, only from the front. Opening the griddle at the top lets smoke into the house. My dad had the same stove set up with vertical exhaust and this was never a problem; we loaded from the top all the time. I think it has to do with that horizontal section slowing down the draft. The other thing, due to the slower draft, you need to take care when starting fire in a cold stove. Even after 3 seasons, I still managed to fill the house with smoke on a cold start a few weeks back. Use lots of paper! 2. Heat shield. Do you have the original owners manual? I found a copy online and read the section on heat shields. My aim was to have equivalent or better heat shielding than they recommended in the manual. I don’t know the full story on your setup, so its hard to say, but you want to have plenty of safety here. I run my stove awfully hot and appreciate multiple layers of security provided by my heat shields. Thank you for your quick response on the short reducer. I’m of the same opinion I think it’s worth giving it a try. I also found a manual online I’ll pull it back out and double check on the heat shields. Good heads up on the top loading liading/smoking problems. I imagine it does have to do with the horizontal installation. I’ll keep it in mind when I get my mine installed and fired up.